In a supply plumbing system, pressure and flow are inversely related — pressure drops as flow rate increases. Copper supply piping was first used in the 1930s. A “cross connection” is a piping arrangement in which waste can back up into supply piping and contaminate it when the pressure drops on the supply side. Three components of the waste plumbing system that have to be inspected are drain, waste, and vent piping. Shower stalls are among the plumbing fixtures most likely to leak. Water supply pressure has no effect on how a toilet flushes because the water used to flush a toilet is stored in its tank. The Plumbing Course is broken into four parts — supply piping, water heaters, waste piping, and plumbing fixtures. The physics of water is covered at the beginning in a simple, common-sense way. You will also learn how systems work and common failure modes. Again, the illustrations add significantly to the learning experience. 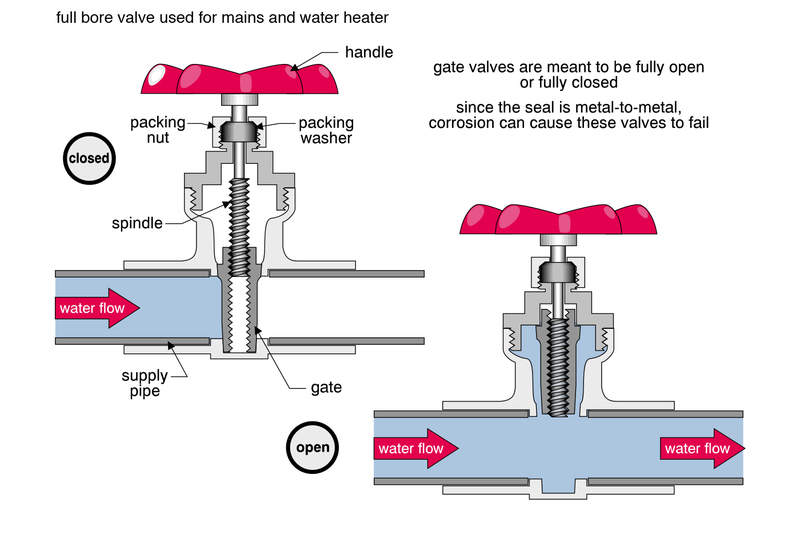 Gate valve — This illustration shows the operation of common shut-off valves. An important and valuable part of a home inspection is locating the main shut-off valve, and showing the client where it is and what it does. It is from our Plumbing Course, Public Water Service chapter. All of our 10 Courses are richly illustrated.